The torrid story of Frank Chambers, the amoral drifter, Cora, the sullen and brooding wife, and Nick Papadakis, the amiable but inconvenient husband, has become a classic of its kind, and established Cain as a major novelist with a spare and vital prose style and a bleak vision of America. I didn't really know what to expect from this book as I have never seen the film, but I did rather enjoy it. I bought a pack of books that inspired films some time ago and felt it was a good time to read one of them. It was a very quick read - I read it on a sunny Sunday afternoon in just a few hours. Frank is definitely a distrustful character. I felt he was out for himself and despite breaking up Cora's marriage he still wasn't satisfied. I suppose a leopard (or a puma in his case) doesn't change its spots so he would always be inclined to drift, although he is prevented from drifting in the end. Cora was not innocent by any means. She sees an opportunity to get out of her loveless marriage and thinks she can change Frank but it ends in tragic consequences for her. Without doubt I felt sorry for Nick, the husband that Cora and Frank planned to bump off, especially when their first attempt went completely wrong and left Nick with amnesia. With not a postman in sight within the book, I set off to find the meaning of the book's title. 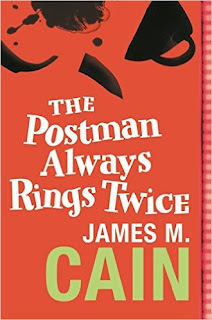 There are a couple of interpretations of the title but the one I liked best is the reference to Victorian postal deliveries. The postman would knock once with regular mail but would knock twice if there was a telegram. As telegrams are usually bearers of bad news, I think this fits in nicely with the storyline. Next time I spot this film on TV, I'll be sure to take a look. I do prefer to read the book before watching the film anyway.